New York pet parents: Thinking about getting a heart tattoo on your dog’s chest with “DOGMOM” written across it? Or maybe a teeny, diamond bone stud for his pierced ear? Of course you aren’t — and anyway, fuhgeddaboudit. Today Gov. Andrew Cuomo signed into law a ban on cosmetic tattoos and piercing for dogs, cats and other pets. New York now joins Pennsylvania as the only two U.S. states to specifically outlaw pet tattoos and piercings, although intentionally inflicting pain on animals would likely fall under many states’ cruelty laws. Similar legislation is currently working its way through the New Jersey state government. The New York bill was introduced in 2011 by Assembly member Linda Rosenthal. She was motivated to do so after she heard about someone in Pennsylvania selling “gothic kittens,” with piercings on their ears, necks and along their spines. 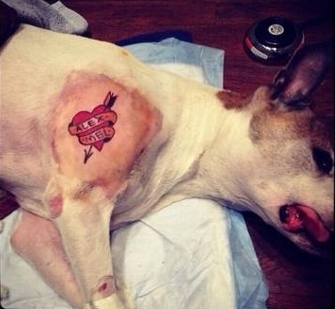 More recently, Brooklyn artist Alex “Mistah Metro” Avgerakis tattooed his dog and posted the photo (above) on Instagram. He claimed he did it while his dog was still unconscious after having surgery. In April 2013, Ernesto Rodriguez of North Carolina did the same thing to his dog. “Got bored, so she got inked,” he wrote in the description of a photo he posted on Facebook. Violators of the ban, which goes into effect in 120 days, will face a fine of up to $250 and up to 15 days in jail. Markings for identification are exempt from the ban, as are ear tags on rabbits and guinea pigs.